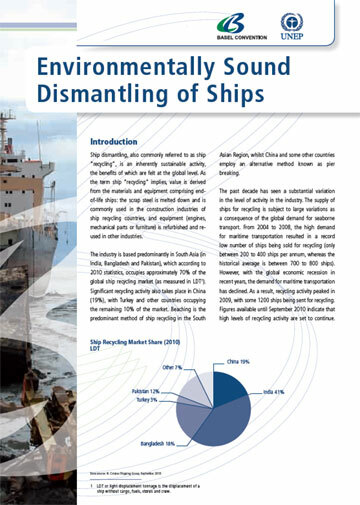 Numerous sets of technical guidelines and tools have been developed to assist ship recycling facilities and governments in improving environmental, health and safety standards in the industry. In 2004, the 289th session of the Governing Body of the International Labour Organization adopted a set of guidelines entitled "Safety and health in shipbreaking: Guidelines for Asian countries and Turkey". 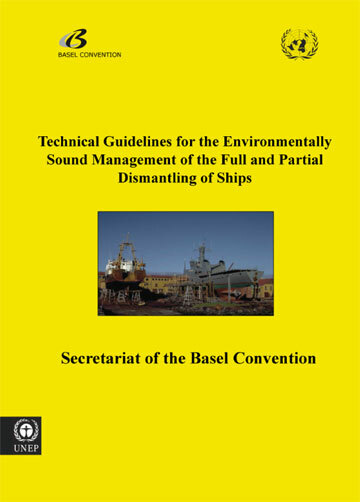 These guidelines are designed to assist shipbreakers and competent authorities to implement the relevant provisions of ILO standards, codes of practice and other guidelines on occupational safety and health and working conditions. The Guidelines are also available from the ILO in Bengali, Chinese, Hindi, Turkish and Urdu. 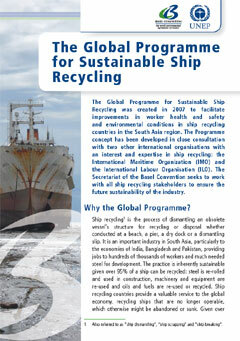 The first set of guidelines to be developed by the International Maritime Organization (IMO) on ship recycling were adopted by the IMO General Assembly in 2003 by Resolution A.962(23), and amended by Resolution A.980(24) in 2005. These guidelines were developed to provide guidance to flag, port and recycling States, shipowners, shipbuilders, marine equipment suppliers and recycling facilities on "best practices", taking into account the full life cycle of a ship.